In this course, you'll learn about the benefits of engineering your Apex code with a layered architectural approach to help ensure a strong foundation to support enhancements and maintenance over time. Play by Play is a series in which top technologists work through a problem in real time, unrehearsed, and unscripted. 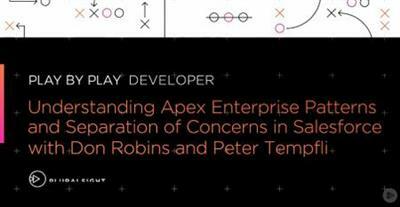 In this course, Play by Play: Understanding Apex Enterprise Patterns and Separation of Concerns in Salesforce, Peter Tempfli and Don Robins explore maximizing the benefits of coding, reuse patterns, and decoupled business logic by carefully crafting libraries of classes that together comprise an architecture that will reduce code breakage and promote both clarity of purpose and developer efficiency. Learn about Apex Enterprise Patterns, explain how and why developers should adopt a separation of concerns architecture for their Apex code, and clarify the differences between frameworks and patterns. By the end of this course, you'll have gained some valuable insight into how to apply these tried and true software development patterns to design and build your own robust, reusable, and scalable Apex architecture.